I had to get a new laptop...it is an HP Windows 10 with Edge browser. Every program is working fine except MTC. Can anyone please tell me how to enlarge the toolbars? They are so tiny and also cut in half horizontally so that I can not even tell the actual size of designs or even enter a size I may want. My curser is larger than the icons so I am unable to click on even one icon at a time. Ok, I am so hoping someone else has been through this and found out the fix/adjustment. Sorry if I sound desperate LOL but I have a project I wanted to finish today, but it won't be possible until I fix this. Ok, I finally found this topic...took a long look in searches. The working to fix it was posted in March...so I am hoping I have missed the fix download. Is it on the forum somewhere? No sorry, @Sherricrafts - there was not a fix for this. You have to play with settings yourself. It's a known issue with older programs not being hi-res icon compatible. Is a fix in the works though?? I posted in your other comment that I have to get a different program. I am hoping that it is only temp though. Is it? I know we all paid for this program, so I am guessing they will fix it? Try right clicking on the screen - click on Display - a control box for display comes up - look down a little towards the middle and you will see 'change the size of ...' change to 150% that should make life easier. I also changed the screen resolution but that might not be necessary. Hi, I have changed the display setting to every setting available and the resolution as well. Curious though, when you say to right click on the screen, which screen are you referring to? In Windows 8 I could right click and bring up a box with the display option but I only get two options now; *select all and print* regardless of what page or program I am in. To change anything I need to go to control panel or computer from start menu. I do miss the right click options and tool bar icons. Hi, yes, I have tried the custom scaling and the scaling for text apps etc. Everywhere changed except the icons in MTC. lol. What if you get an external screen? Thank you...I have contacted HP and will speak to someone on Monday. I have tweaked in the registry many times in Windows 8 but this computer is only two days old and I am hesitant to do that. But I am saving your post in my email in case I get brave or desperate enough. I downloaded a program that works fine and I will give it a chance, if only because they create upgrades and updates continually for their program to match these hi res changes. @tuicarlos It works for me - res. 2560x1440 and icons at 150%. MTC is as is without downgrading to Win XP. Win 10 updates regularly so I am up to date with the version that it installed on my PC. Don't understand why I'm not up to date in your book with Win 10. Can you explain please. By the way I had all my teeth out so I no long suffer from an abssess. LOL. @tuicarlos - when I first got my Hi-res screen the icons were miniscule! I could not distinguish them they were so tiny even with Win10 (free). My laptop which I bought a year ago and also has Win10 on it works fine with my icons visible although my screen icons are a little small. Obviously each has it's own problems. On my PC Win10 has upset my CD/DVD player on both my old computer and my new one!! It's a real pain as I can no longer record my mp3 to audio or put a data disc in to read. Chuckling - yet another example of upgrading!! My computer does not have an option for 2560 x 1440. It is 2560 x 1660, still below the 2000 for second number, but still too high to work. I have tried ALL the settings available and sadly none work. It would be wonderful if someone could take Andy's place and continue on with updates for MTC to keep up with all the tech changes our new computers come with now. I know one thing...lol, once this computer begins is old enough...in a few years, I will absolutely build my own. No doubt it will be expensive, but to have options to run compatibility modes and create the changes necessary it will be worth it. I will keep hoping that someone will come in and take control of updating MTC for us, but as I understand it, that is not likely. It is such an amazing program and I was just learning it. For now, I will use something different, because I have to. I considered fixing my window 8 computer and using it...but to have it only for mtc is too much hassle. LOL As for an external screen...the way I use my laptop from room to room would also be a hassle, but it is a good idea I have limited space on the desk I use to create and it needs to be in the room when I am cutting with mtc because the cutting machine is blue tooth...short range. But other times I have my laptop in 2 other rooms and used to use MTC program wherever I was. Great suggestion though! 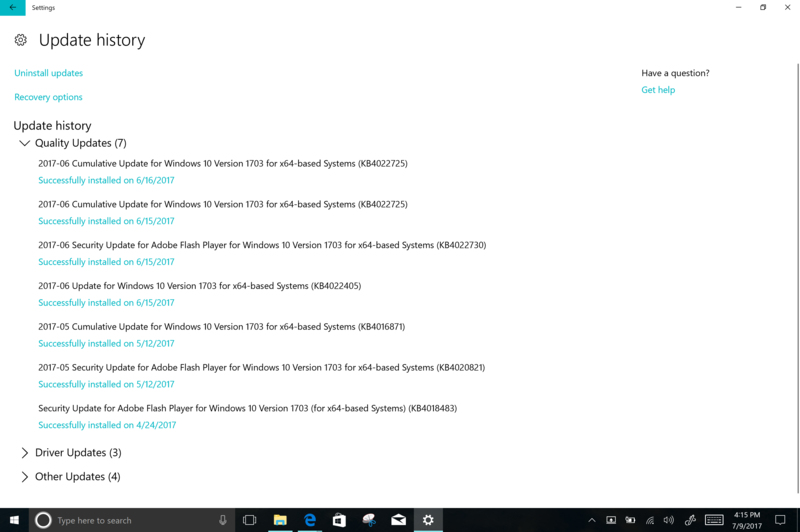 what version of windows 10 are you using ? Hi, I have Windows 10 Pro version. I needed a computer in a rush and it was able to be here in a couple of days so I went with it. Never liked Win 8.1 so it was an easy decision at the time. I only had a few problems with Windows 7 and preferred it for many things. 1. Right click on the Make the cut icon. Select "Properties"
2. Click on the "compatibility" tab. 3. 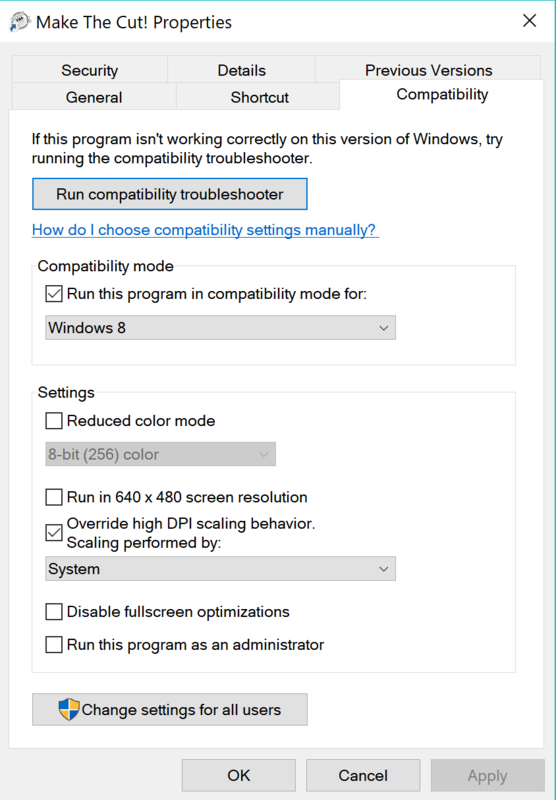 In the "settings" section, select the checkbox for "Override high DPI scaling behavior. Scaling preformed by:"
4. In the drop down menu right below the box, select "system". 5. Click "apply" then "ok". 6. start the program to see the changes. This has been driving me nuts for the past 6 months, and I'm glad to finally have an update to it that doesn't involve going into all the computer IT type stuff to fix it I hope this helps someone out there! @happypolkadotlife - this is a relatively new update to Windows 10 (part of the Windows Creator update I believe). Microsoft got a lot of complaints about this, they finally did something about it. Thanks for sharing that happypolkadotlife. Perhaps it will help others with the same issue. Yes, I forgot to say Thanks!! Good info. Thanks for posting this. I have been holding back on getting a new computer because of this problem. Thank you!! This is the best news, hopefully it works lol. I have been complaining to them that's for sure LOL. But this has been such a hassle for so many of my programs that are useless right now, that I am going to be patient and update when offered to me. Hard to wait though!! Thank you for posting this information, I will definitely be keeping close watch for the release for my computer! It is the same with Inkscape...I ended up purchasing Adobe Illustrator CC. I have wanted it, but not yet, it is so expensive. I often miss the days when you could buy the programs and just update when you wanted to. You may already have it. The only way to know is to follow the instructions, in the link above, and choose the right option in the list. Previously Microsoft had different options that did not solve the problem. If you get automatic updates, this would be part of it, and you would not get any notice that tells that this was fixed. Hope that helps. This was fixed in April. I do not have that drop down in compatibility tab. I do have the *Disable display scaling on High DPI settings*. When I check the box, there are no options, no drop down box(es). I will continue to complain...this is a relatively new computer...since May and next time I get one, I think I will build it to the specs I need. @Sherricrafts - get Windows to check to see if there are updates. Wow, I really hope that is the case and that it fixes it for me, that is until these software programs release updates with fixes or patches for those who use Hi Res display that do not have options for scaling to work. And YES, there is another Creators Update planned for the fall of 2017. Hi happypolkadotlife I am so HAPPY for you I know how it feels to not be able to use your favorite softwares. I SO wish my computer offered the drop down box options that you list here...so many people here I see have it. I spent weeks working on this and hours with tech supports, more than one and no go. I thank you so much for giving this solution to others. Hopefully, the next update in the fall will help me. It is for DPI issues but I have not seen my problem listed as yet. These are my latest updates - I purchased this laptop last year (thanksgiving), and have it set to automatically update, and haven't had any issues with updates since then. this is what my compatibility menu looks like. Windows updates KB numbers may differ based on wether or not you have 32 bit vs 64 bit and some other factors like version of Windows. Woo Hoo! OK everyone I was finally able to install Creator update and have it work! MTC is working correctly finally! After many hours with tech support in HP....discovered a few things missing on my laptop. Too much to explain and I would not remember all the changes and fixes anyway LOL. I had more problems than I realized but did not want to go through the trouble of replacing my laptop if not necessary. I need to thank everyone a huge thank you for all of your advice and help, sincerely from the bottom of my heart a very large thank you and appreciation. @happypolkadotlife My laptop now has the drop down box for the DPI settings. I never would have discovered all the problems I was having if not for your post about the Creators update, so I owe you big time!! I can never thank you enough. As a bonus, I love many of the new features that Creator brought and have installed a few of them...the extensions. My husband even updated his laptop So THANK YOU again so very very much!! Now...can anyone explain why during this post my *enter* key will not allow me to get the typing curser on the next line? LOL The page will scroll down, but my curser stays at the end of the previous sentence...I can't stop in the middle of the page and start a new paragraph without using the mouse to click in the spot I want. Anyone here ever have this happen and fixed it? LOL Maybe should be separate post? @Sherricrafts - thanks for letting us know, yayyyyy! Glad the Creator Update worked well for you. Doing the happy dance for you! For the browser issue, what browser are you using? The new Windows 10 one Edge or Chrome or other? Hi, Yes, I have Windows 10 Pro with Edge. Purchased in May. So, yes, it's new, but I did not want to go through setting up a new one. I have a 3 year warrantee but I decided to see if the registry errors and other problems could be fixed. Thank you for your reply! You are always soooo helpful and encouraging, I love that! Oh, nvm...the arrow key is now not working on this site LOL So strange, it is only on this site. I will talk with them about it today. Thank you! Keyboards aren't very expensive. So you could certainly go to Staples, Office Depot, Target, or Best Buy and find a very good new keyboard.